Z received a new CD in the mail yesterday. Ok she got her first and only CD lol. She got Baby Rockstar Frozen. Basically it is songs from the Disney Movie frozen done as lullabies. When I put it on she was whining a little but as soon as the CD started she just stopped and listened to the whole thing. 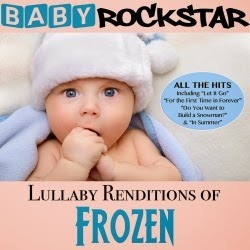 Amazon describes it as Baby Rockstar rearranges the chart topping hit as beautiful melodies played by soothing bells mixed with sleepy tones and light percussive effects. These calming and dreamy renditions will help get your little rockstars ready for bedtime. Baby Rockstar releases ignite a musical curiosity in your little ones and will be favorites of young children, and their parents, for years to come. Z still has the case to this and won't let me see it anymore. It is a good thing that the CD itself is still in the radio in the kitchen because I doubt that I will ever get the case back lol. If you would like to hear a sample of the songs you can on the Amazon page here. The CD goes for $12.59 or you can get it as MP3 for $8.99. Or you can just take Z's word for it.